According to the American Association of Retired Persons, 90% of seniors want to stay in their own homes, also known as “aging in place.” As our loved ones ‘age in place’ it is inevitable they will lose some of their independence. As caregivers, there are safeguards which can be implemented to ensure our loved ones stay happy and healthy. Safety is a key factor when keeping our elderly community independent and healthy. In-Home Aides – Having an aide visit the home for a few hours each day can reduce the risk of being hospitalized. Carol Levine, director of the United Hospital Fund stated, “Older adults who have been hospitalized and go home alone or without an in–home aide are twice as likely to be readmitted to the hospital within 30-60 days.” If you take a moment and think about that, it’s a remarkable statistic. In-home aides keep clients safe and prevent loneliness, making them a key piece for seniors to age in the home. For more information about in-home aide tasks, please refer to the article titled Understanding the Basics of Home Care on our blog page. 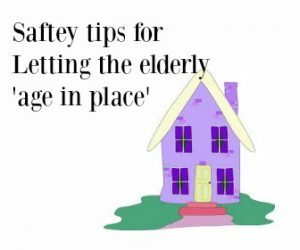 Home Modifications – Making simple changes to the home can improve safety by reducing falls and preventing hospital visits. Most of these modifications are simple and cost little to no money. Remove area rugs as they cause clients to slip. Grab bars in the bathroom provide the ability to shower independently and make individuals feel safer and confident in the space. Personal emergency response systems ensure the disabled and elderly community has a quick medical response when help is needed. Some systems can detect a fall without the individual having to press the button. Alert systems give our seniors a sense of safety and security in or out of the home. Installing lever-handle doorknobs is a minor change that can make a drastic difference. Twist knobs can be hard to twist and grasp hindering the ability to remain independent. In-home aides and home modifications are just a couple of ways we can help seniors maintain independence in the comfort of their own home. Ashe Home Care, Inc. is committed to keeping members of the community safe and provide help with resources needed to accomplish the end goal. Will you let Ashe Home Care, Inc. be your partner for independent living?